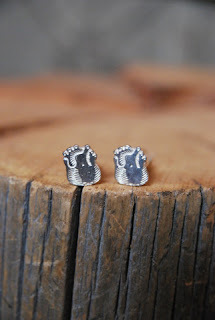 We just got in some new stuff from one of my personal favorite designers.We have also restocked all the staples from the 'Don't Give Up the Ship' Ring, Compass, Diamond, & Heart Signet Rings, and the Battle Diagram Rings. So if you or someone you know has been swooning over this stuff now is your chance to nab this stuff without having to wait! Brand new from the perfect triangle collection, this is one of my favorites. The Heart Signet Necklace is available in oxidized solid sterling silver. A miniature version of the Heart Signet Ring, the charm measures .5 inches top to bottom and side to side and comes on a 26" sterling silver chain. 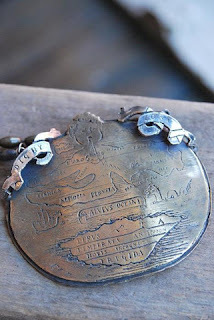 The edge of the ring reads 'Desio Me Mena' which translates from Italian to 'Desire Carries Me', a quote from Petrarch's 1342 work, Canzoniere. In addition, the ring is a working wax seal for your personal correspondence and comes with one stick of red sealing wax. From the Perfect Triangle Collection, this ring is oxidized Sterling silver with Brass Pyramids. Used since the ancient days of nautical navigation, sounding weights were a vital tool for guaging depth. Our Sounding weight necklace is adorned with a two master schooner. 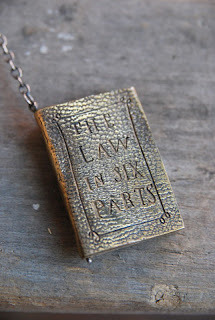 The necklace is available in oxidized brass on a 26" sterling silver chain, weight is 1" tall. Auribus teneo lupum' translates from latin to mean 'to catch a wolf by the ears'. 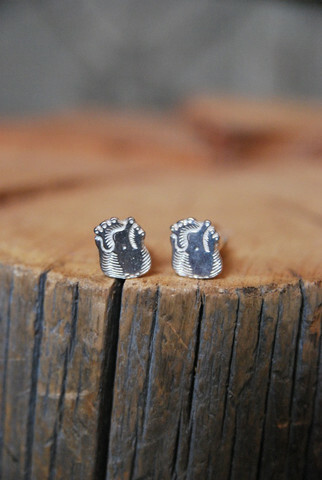 Do you let go of its ears and take your chances or hold on forever? 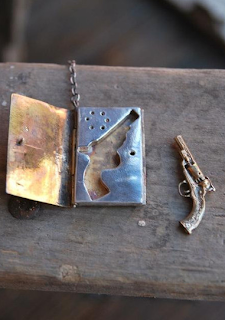 The Law in Six Parts locket is a miniature book that opens to reveal a revolver and 5 bullets hidden within the pages. The necklace is oxidized sterling silver and brass on 26' chain. The book measures 1 5/8" tall by 1 1/8" wide and .25" thick. The Guide to the Surface of the Earth medallion is a map from the age when the earth was believed to be flat and mythical creatures and certain death were thought to reside just beyond it's boundaries. 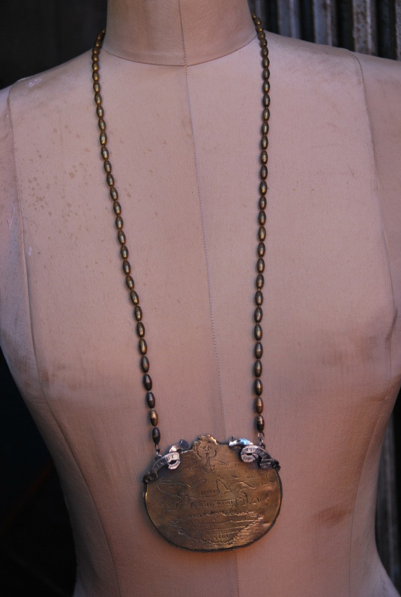 Medallion measures 3" wide by 2.5" tall, is oxidized brass with sterling and come son a 30" vintage brass chain.